Oriental Rug Spa offer a specialist Persian, Oriental and Contemporary rug cleaning in Bisley. We also offer a rug repair service. If you own a dirty or soiled rug that needs professional cleaning, then why not give us a call on 01276 423150. You can drop the rug into our wash facility or arrange a time for us to collect from you. Bakhtiar rugs are woven by the tribe of the same name, also referred to as Bakhtiari. The tribes used to travel around the southwestern areas of Iran. In the summer they will seek high ground to escape the excessive heat, and in the winter they will seek lower levels to escape the snow so that the sheep have grass to graize upon. 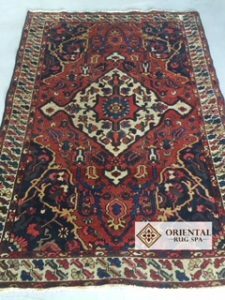 Bakhtiari rugs are woven with a cotton foundation and a woollen pile, which is usually quite deep and thick. The rugs are solid and very hard wearing. The tribes tend to use the wool from the sheep within their own herds. Most Bakhtiar weavers are now settled in towns in the central to southwestern areas of Iran. Antique Bakhtiari rugs, similar to the one on the left, are very desirable with collectors and are thought of as quite valuable.